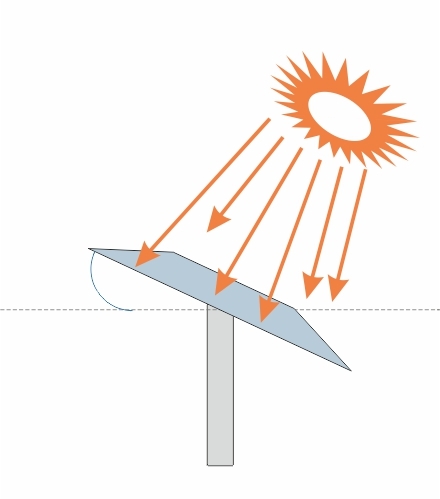 What's the optimal angle for my solar panels? Enter in your country, state, and city to calculate the optimum tilt of your solar panels every month. The optimal angle for your solar panels varies throughout the year, depending on the seasons and your location and this calculator shows the difference in sun height on a month-by-month basis. For even more precise angling, you would need to track the sun as it moves throughout the day on a minute-by-minute basis. This can be accomplished with an automated mechanical solar tracker, but unfortunately this is not very economical. The sun reaches its peak at solar noon each day (exactly half way between sunrise and sunset) and this calculator shows the angle at that time of day. 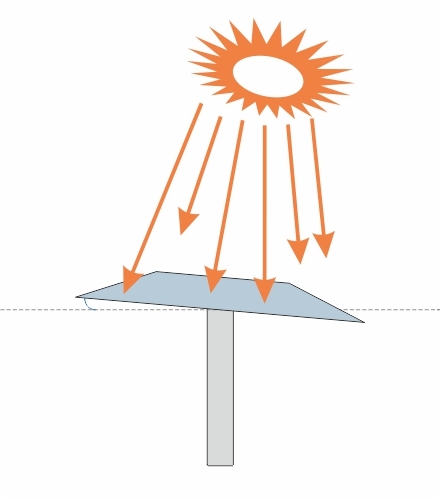 At solar noon, the irradiance from the sun is at its zenith and you can generate the most energy. As an example, the sun is due south at solar noon in the northern hemisphere. 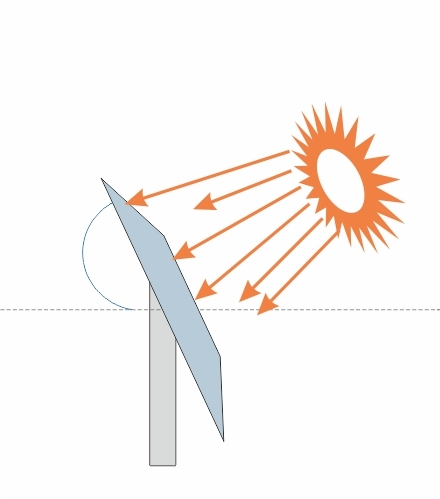 To get the best performance out of your photovoltaic panels, you would face them due south at the optimum angle so that the panel is receiving as much sunlight as possible at this time. The best angle for your solar project also depends on when you want to get the best out of your photovoltaic system. If you want the best performance during the summer months (when there is the most sunlight), you would angle your photovoltaic panels according to the height of the sun in the sky during these months. If you have the ability to adjust your photovoltaic panels throughout the year, you will benefit from having the optimum performance from your solar system all of the time. Hearty wishes to you all in Shakti Pumps. We are a small group of brothers, who have installed 3nos 5HP Pumps to the bore well. Thanks to the timely help and action. Our 9acres paddy crop is saved. At the same time having installed the pumps, I bought 2000 Equity shares of Shakti Pumps @ 172. Oh! My phenomenal jump and good annual result. God Bless the entire team of performance and give you more energy in bringing the solar energy into noble use. As India's leading manufacturer of energy efficient submersible pumps, we are well-known in our industry. We create our products for a number of sectors including agricultural, industrial, domestic and horticultural. However, this wasn't always the case. Since our humble beginnings back in 1982, we have worked hard to get to where we are today and have had to embrace every opportunity that has come our way.